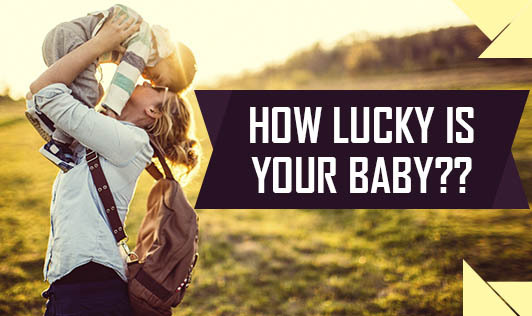 How lucky is Your Baby?? Are you thinking about planning your delivery on an auspicious/lucky date? Couples try their best in choosing a lucky day and time to go for a C Section to deliver their baby. It is believed in some traditions that being born on lucky dates or babies born on repetitive dates are lucky and also will bring in good luck for their parents. They are believed to be angels or messengers of God! Though many people believe that the time of birth of your child determines destiny, one should also understand that birth of a child in itself is one of the most miraculous and an incredible phenomenon that each of us muct appreciate and add value to! The day on which this miracle takes place should be a lucky and an auspicious day not what one chooses! Rather than spending your time on selecting a lucky date or time for the baby's arrival, make sure the mother and the baby is healthy and safe and are provided with the best facilities for the arrival of the little one! Let your baby and doctor decide the day and the right time for birth! Wishing you a safe and healthy delivery!